For ages now you’ve been squinting and straining to see clearly while you’re driving. Or maybe you have to hold your favorite newspaper further and further away in order to make the print come into proper focus. 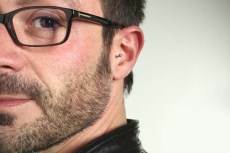 You have finally made the decision to get glasses, but where do you start? Click on the image to view an explanation of each field on your prescription. First of all, you have to go see your doctor or optometrist to get your eyes checked. Here they will do tests to determine whether you are nearsighted (myopic) or farsighted (hyperopic). When you’re done, the doctor will hand you your prescription. Make sure to ask your doctor to measure the distance between your pupils (PD). 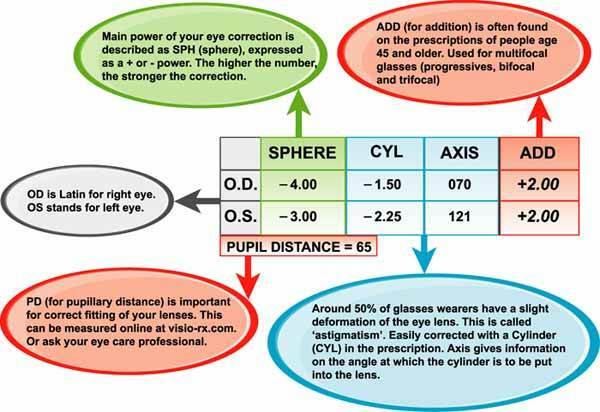 This measurement ensures that the optical center of your glasses will be directly in front of your pupils. If your doctor writes your PD as two separate numbers, just add them together. If you already have a prescription that does not include the PD, you can measure your PD in just a few simple steps with our Virtual Mirror. What do all these terms and numbers mean? Let’s start with the abbreviations. Latin for "Oculus Dexter," meaning "right eye." Everything in this row corresponds to your right eye. Latin for "Oculus Sinister," meaning "left eye." Everything in this row corresponds to your left eye. Amount of lens power needed to correct your vision, measured in dioptres. This number always has a + or a - in front of it, to identify whether a plus or a minus lens will be used. Amount of lens power needed to correct astigmatism, also measured in dioptres. If a number is present here, it is always accompanied by a number in the AXIS category. Measured in degrees. This number is needed to correctly position the lens into your chosen frame, in order to properly correct astigmatism. Refers to the amount of power needed in the reading portion (or near vision zone) of a multifocal glass (bifocal, trifocal, or progressives) in order to treat presbyopia. Also measured in dioptres. Amount of prismatic power needed to correct eye alignment problems. Measured in prism dioptres. If a number is present in this category, it is always accompanied by a value in the BASE category. Refers to the direction of the above mentioned prism. Can be expressed as "base up" (BU), "base down" (BD), "base in" (BI), or "base out" (BO). Abbreviation for "pupillary distance." Measured in millimeters. Generally speaking, this number can fall anywhere from 40 to 80. Having explained the abbreviations, let's translate the prescription into words. This person needs -1.25 dioptre to correct for nearsightedness, needs -2.00 dioptre correction for astigmatism at an axis of 90 degrees and has an added power for reading of +2.00 dioptres in the right eye, in addition to a prism of .6 base-up. In the left eye, the sphere is -1.75, with a cylinder of -0.75 at an axis of 160, and added reading power of +2.25. Choosing a frame that suits you perfectly is easy and fun with our Virtual Mirror. After you get your prescription, it’s time to figure out what kind of frames and lenses you would like. Of course, for the fashionistas out there, we also offer frames with plano lenses (plano lenses are plain lenses without any corrective power). When you’re ready to start, simply click on “Frame Search" in top navigation bar. 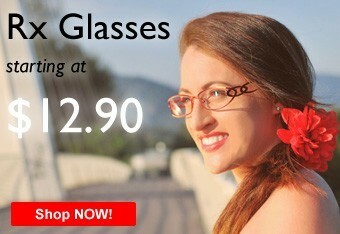 From there, you’re only a couple of clicks away from your new pair of glasses. We’ve made the process as simple as possible, so that you can order worry free. We’re looking forward to helping you.